We are offering a basic parts kit at a greatly reduced price! If you were to purchase these parts a la carte from us or other suppliers, you would pay over $675. Our price is $439! 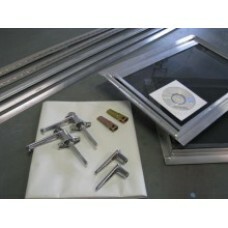 Two (2) 12" x 18" crank-out self awning screen/windows (these windows are no longer available and have been replaced with a 12" x18" slider window) You do have the option to upgrade to a 15" x 18" crank out window with radius corners with black glass for an additional charge. Pictures soon on our website of this window. Plans: Over 150 pages, over 200 photos and drawings of our comprehensive plans on CD. Print it out on your computer and you're ready to build!